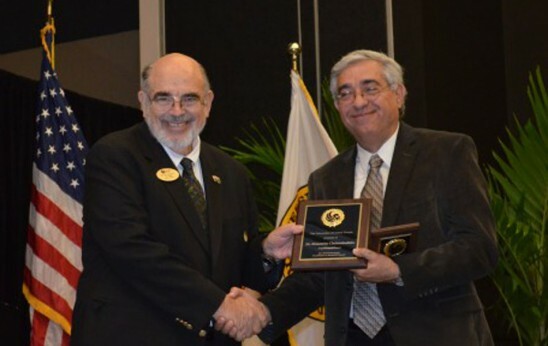 MJ Soileau, UCF vice president of Research & Commercialization, presents the University Award for Excellence in Research to Demetrios Christodoulides earlier this year. Demetri Christodoulides, a research professor in UCF’s College of Optics and Photonics, has been named to the Thomson Reuters Highly Cited Researcher List, identifying him as one of the top 1 percent of researchers cited in his field. Christodoulides, a world-renowned expert in nonlinear optics, is one of just 18 people from Florida named to the list created by the media and information company about every 10 years. This latest compilation was based on articles and reviews in science and social sciences journals from 2002 to 2012. Christodoulides is a Provost’s Distinguished Research Professor in UCF’s Center for Research and Education in Optics and Lasers. He also is a Pegasus Professor, the highest academic honor presented at the university. Christodoulides received his Ph.D. from Johns Hopkins University in 1986. Before coming to UCF, he was with the faculty of the Department of Electrical Engineering at Lehigh University from 1988 to 2002. His research interests include linear and nonlinear optical beam interactions, synthetic optical materials, optical solitons, and quantum electronics. His research group was the first to discover that a light beam in free space can travel a curved path, which led to a new class of light beams, known as “Airy” beams. The discovery started a new area of research and his paper on the finding is in the top 10 most-cited articles in the Optics Letters journal. He also is considered the “father” of discrete optics, producing breakthroughs that impact the world of telecommunication and optical computing. Christodoulides is a Fellow of the Optical Society of America and the American Physical Society, and in 2011 received the R.W. Wood Prize of OSA, one of the most prestigious prizes in optics.